Pod Tanks are rotationally moulded tanks. placed into an industrial oven. 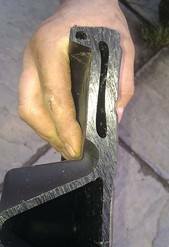 The mould is turned through all directions so as the plastic melts it assumes the shape of the steel mould. When the plastic cools, the mould is removed and you have a plastic tank. Rotational moulding is an excellent method of producing strong tanks in a cost effective manner however you must very wary when buying a rotationally moulded tank. Rotationally moulded tanks can be very weak and totally unfit for their intended purpose. The design of the tank. The type and grade of plastic. The skill and professionalism of the moulder. A Sewage treatment plant is only as good as the tank it is in. If the tank fails, the entire system fails. The design of the tank is vital in ensuring that it will be strong enough for its intended application. A tank can be made from adequate materials but if the design is wrong the tank will bend and fail. A circle is the strongest shape because wherever pressure is applied the rest of the circle will oppose this force. This is called hoop strength. A tank that is square or rectangular in profile is much weaker due to a lack of hoop strength; the flat sides can deform because the shape of the tank does not oppose the external force. One of the flaws in many tanks is a flat base. The base of the tank is the most vulnerable part because it is the deepest and therefore exposed to the greatest pressures. A simple flat base is a very weak feature compared to a convex base. The FilterPod tank has a flat base in profile. To strengthen the base of the tank we have incorporated kiss-off features. A kiss-off forms a bond between two layers making both layers stronger than the sum of their parts. The Kiss-Off is the joint between the two parts of the mould. It is thicker than the rest of the moulding. Even given the kiss-off features, the FilterPod tank it is not strong enough for all ground conditions so the design also features ducts into which steel reinforcement bars can be inserted. Even given all modern materials and design techniques the only way to give the flat base sufficient strength was to use steel and we are not aware of any other tank manufacturer who has done this. A ribbed tank wall is much stronger than a straight smooth wail. Many tanks are smooth or only have shallow ribs and this greatly reduces the inherent strength of the tank in the same way that corrugated cardboard is stronger than normal cardboard. The majority of rotationally moulded tanks are not designed to with stand 100% hydrostatic head – where the water table is at ground level. This is essential because many sites can become waterlogged at some times of the year and freak extended rainfall periods will always occur. Manufactures will often stipulate that the tank cannot be installed on a site where the water table or ground water rises above a certain point on the tank, such as the outlet pipe. These tanks are not designed to withstand 100% hydrostatic pressure and you have no control over rainfall, snow, the water table or ground water. Because it is impossible to create a waterproof surround for an underground tank the tank itself must be inherently strong enough to withstand the enormous pressures it may be subjected to. Please see http://www.podtanks.com/concrete_installation_myth.html . Are reinforced with steel when required. Are designed to withstand 100% hydrostatic pressure. Underground tanks should only ever be made from HDPE. Plastics used for rotational moulding are not regulated in the same way as injection moulding plastics are. This is a significant problem for the rotational moulding and plastics industry because you cannot take data sheets for two different materials and compare them. Because of the lack of regulation there are no parameters as to what constitutes LDPE, MDPE or HDPE. This lack of regulation is terrible for the consumer because it is impossible to compare tanks unless you know exactly which material tanks are made from and have a technical knowledge of these materials. A manufacture should always be able to tell you exactly what plastic the tank is made from in terms of the manufacture, the product range and specific powder (i.e. – ICO Polymers, Icorene, 1339). Simply calling it HDPE is not sufficient. Manufacturers may refer to virgin and regrind materials. As the name suggests virgin material is brand new powder. Regrind is made from the offcuts and waste of previous tanks. Although regrind is chemically the same as the virgin powder it is inferior because of how the material may have been processed (see below). Some manufacturers employ a technique known as blending where they will mix different plastic powders together to make a tank. This should never be done for underground tanks because the resulting plastic has no verifiable or tested qualities. It is almost impossible to mix different powders together uniformly and variations in wall composition results in weak spots. Blending is only ever done to save costs. Are only made from virgin powder. Are never made from blended powders. The skill and professionalism of the mould is paramount. A bad moulder can be given the same mould and powder and produce a totally unsuitable tank. The temperature of the oven. The application of heat at specific locations at specific times. The length of time the material is processed. 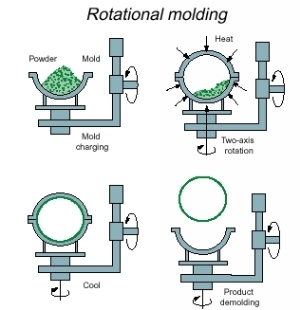 The control of the mould rotation. The above points will affect how the plastic melts, flows and sets. It is essential that each aspect is done correctly so that plastic does not “burn”, degrade and is a uniform thickness throughout the tank. A tank with incorrectly processed plastic is useless. The tank should be a uniform thickness. The tank should be a uniform colour on the outside. Blending or incorrect moulding can result in the tank being a different colour in certain places such as bends and corners. The tank must not appear to be speckled or flecked. The tank must be a uniform colour on the inside. The inside of the tank should be the same as the outside. Blending or incorrect moulding can give the inside of the tank a speckled or flecked appearance. The tank must be smooth. Never buy a tank where the external or internal surface feels rough or textured. Some tanks are deliberately made to look like rock or gravel so the non-uniform colour is to be expected. For aesthetic reason some tanks are deliberately textured but this is usually only done on the external surface. A sand paper like internal surface should be avoided. Are moulded by the world’s biggest rotational moulder. Every tank goes through a strict quality control procedure. Every tank is weighed by an independently company to ensure the correct amount of powder is used. The wall thickness of every tank is measured by an independent company.